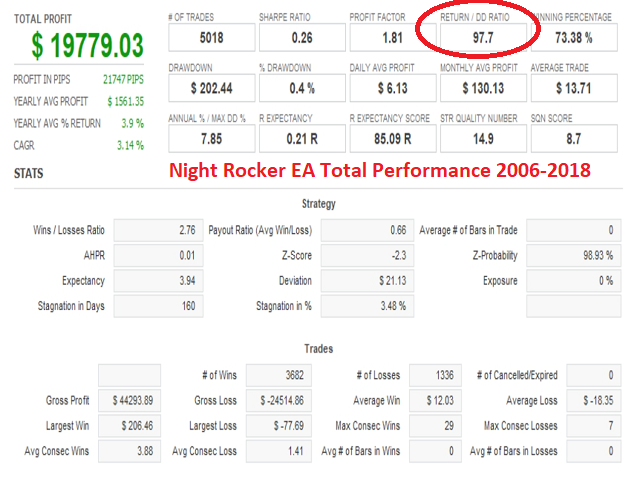 Night Rocker EA is a night scalper that has a system for evaluating market volatility and trades during a period when prices are flat. In addition, there is a built-in filter of spread and slippage. Each open order has a stop loss and take profit. Also, the market volatility assessment system closes orders when market conditions change in a negative direction for the trader. 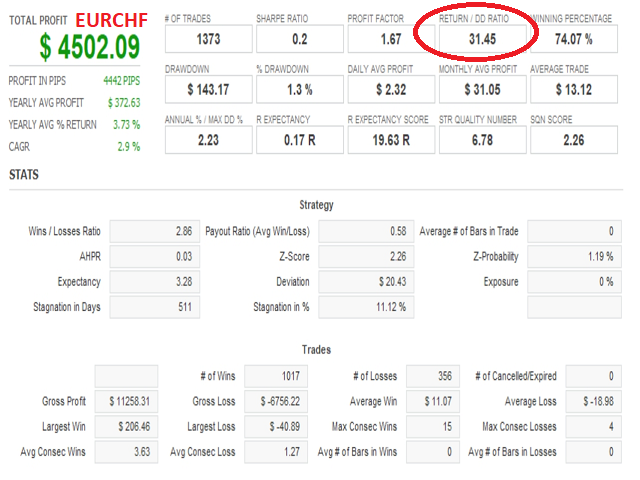 The Expert Advisor works on USDJPY, GBPUSD, EURCHF, GBPCAD pairs. Period M15. The internal control system for working with the terminal allows you to control the current trading situation and open and close trade orders optimally in time and price. The adviser will not enter the market if there are delays in the operation of the terminal; it will enter on the next tick that will be working. This eliminates long delays in opening orders and strong price slippage. A through optimization of all the working functions allowed the EA to be made the fastest of the existing analogues. Therefore, the adviser does not have a separate demo version. On the real account and on testing, the same program code works. This ensures that the results on a real account and testing match. When creating an adviser, the famous WallStreet ASIA adviser was taken as a guideline. 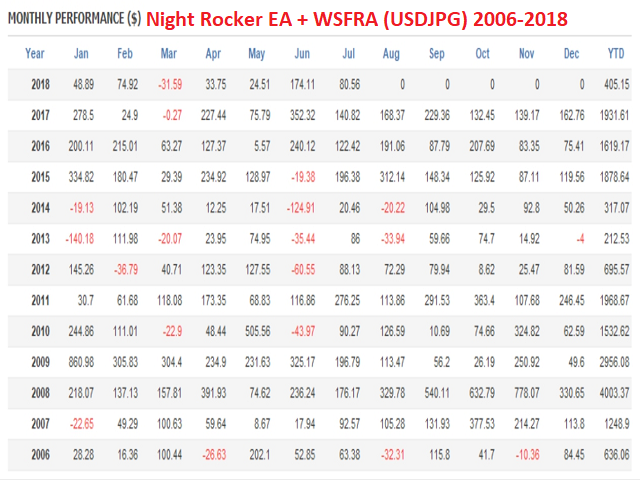 When tested in the period from 2006 to August 2018, the total profit of Night Rocker for all pairs (the ratio of profit to drawdown) was 97.7. For comparison, WallStreet ASIA showed a result of 66.07. 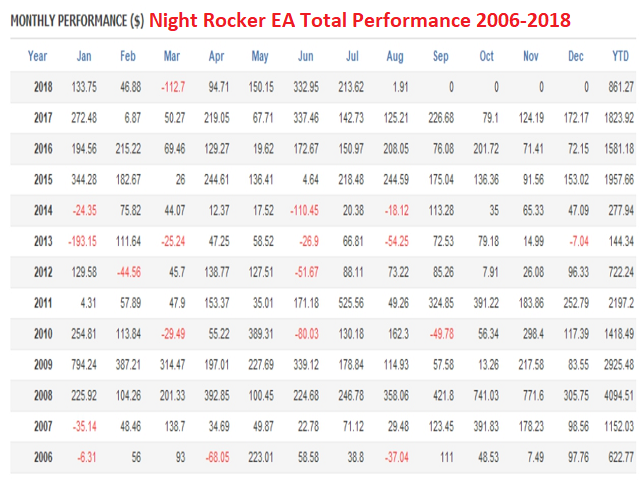 Night Rocker was 46% more profitable. Until 2006, all advisers trading on low volatility show substantial profits. WallStreet ASIA owners can temporarily use WallStreet ASIA on the USDJPY currency pair. The total profit for all pairs is then 105.6. • if this robot works on the same account with other robots, then each robot must have its own unique magic numbers! • It is recommended to use a demo account before bidding with real money. This will help you become familiar with how an advisor works before you go to real accounts. • Be careful when determining trading volumes. The recommended volume is 0.01 lots for every 50 dollars of your balance. • If it seems to you that the adviser is not working properly, stop working and contact the developer immediately! • Advisor is compatible with all MetaTrader 4 brokers, as well as with brokers using ECN accounts. You do not need to change any settings. • The Expert Advisor automatically recognizes whether your broker uses four or five decimal places. You do not need to change any settings. • It is not recommend starting and closing your trading terminal too often. Ideally, it should work without interruption from the opening of the market on Monday until closing on Friday. • Maintaining a stable Internet connection is essential to ensure reliable operation of the robot. • order_magic: a unique identifier, thanks to which the adviser recognizes and manages its own positions. If you use other robots in the same account, make sure that each of them has its own unique identifier. • cmt: you can enter a comment here if you want to mark the transactions of the adviser. • max_spread: maximum allowed spread. • slippage: the maximum allowed slippage. • lot_start: trading volume. This advisor has a fixed value. The recommended volume of 0.01 lot for every 50 dollars of balance. 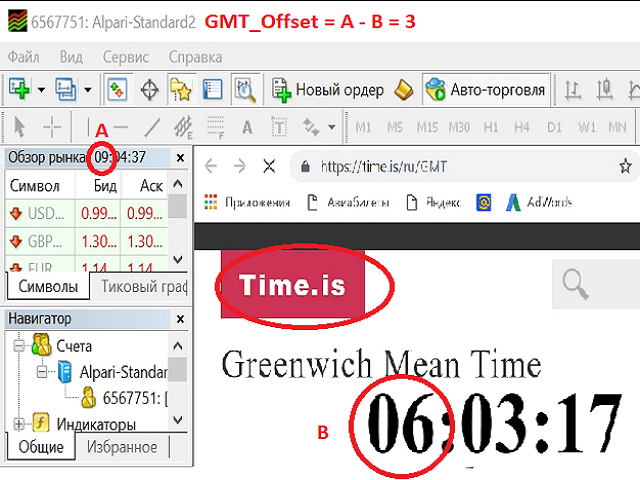 • GMT_Offset: the value of this parameter should be the current GMT Offset of your broker. 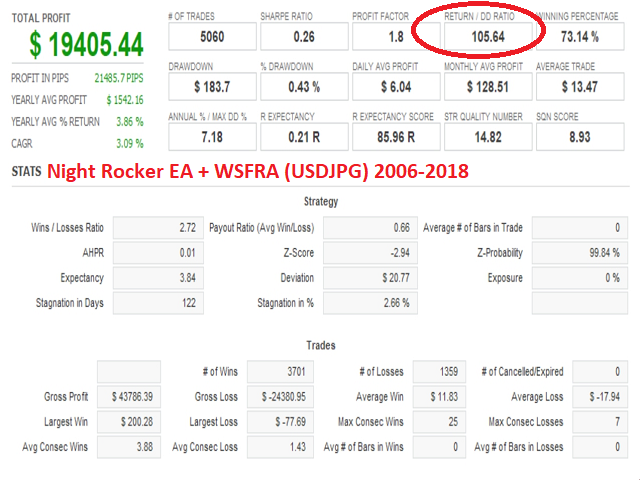 In addition, if you are performing a backtest, you must enter here the correct GMT Offset for the historical data you are using, otherwise the test will be incorrect. • AllSymbolOptimum: the choice of how to optimize the work of the adviser. 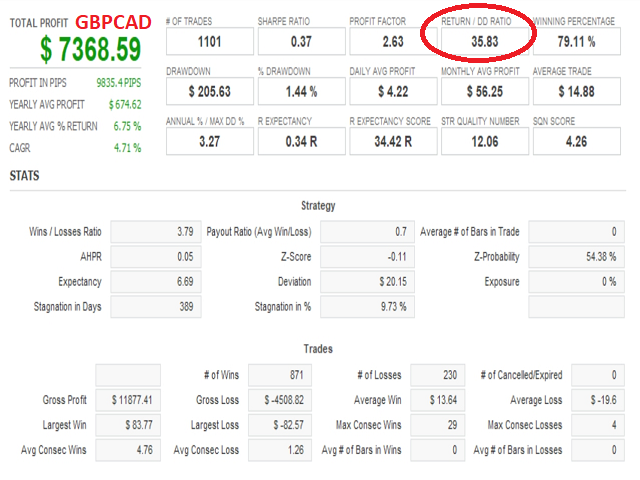 All - maximize the profit of the robot over the entire volume of available currency pairs. One - maximizing the profit of a robot for a given currency pair. The adviser is pretty good. Very fast on test and no more thinks on menu that just required. The first results not the test and on real the same. Let's look further. 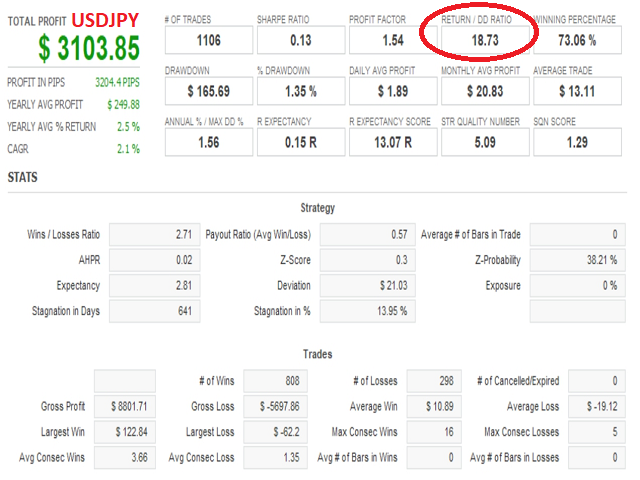 Results of work on all currency pairs are improved. The internal control system of work with the terminal is improved. The error in calculation of trade time is corrected. The mistake significantly worsened results of trade of the adviser. Despite it, the adviser showed in December, 2018 profitability of trade in 40% of an initial deposit. Productivity of currency pairs is improved. 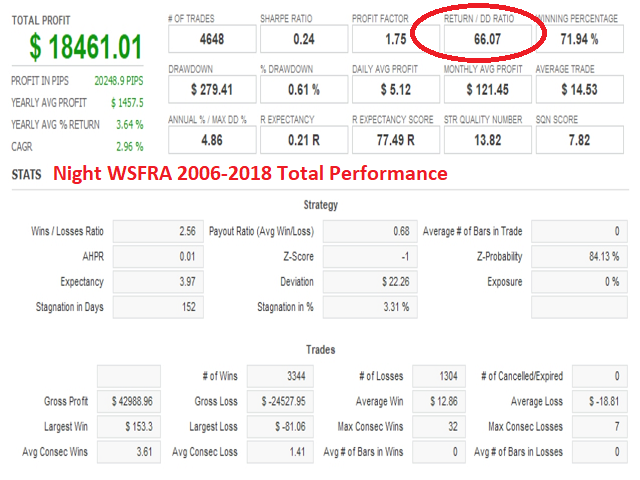 The total profitability of the adviser is improved to an indicator 107.29 since 2006! In the list of parameters of the EA identifiers, but not comments on them are displayed! The general profitability of the adviser is improved.